The "Earth cut" frame serves to specify the shape of an open cut. 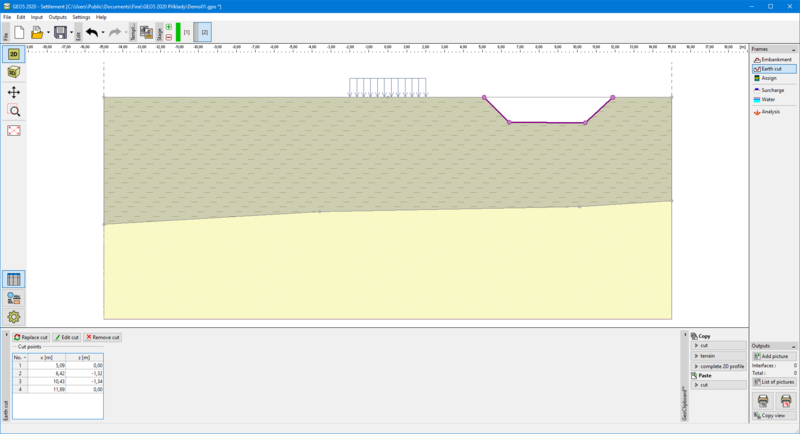 This function allows for modifying the terrain profile within a given stage of construction. Several earth cuts can be introduced at the same time. In such a case some of the lines in the cut appear partially above the terrain. A table listing individual interface points is displayed in the left part of the frame. Inputting an earth cut interface follows the same steps as used for standard interfaces. An open cut cannot be specified in the first stage of construction. An earth cut cannot be built if there is an embankment already specified in a given stage - in such a case either a new stage of construction must be introduced for earth cut input or the existing embankment must be first removed. Input interfaces of an earth cut can be copied within all 2D GEO5 programs using "GeoClipboard".